Notes on moving from a Nikon to Canon digital SLR system but retaining and using the Nikkor AI lenses. I've had a single Nikon based SLR since my purchase of a 35mm Nikkormat FT3 in the late 70s and the system was slowly built up with a number of the manual focus Nikkor AI lenses. When digital SLRs became more affordable, a Nikon DSLR was therefore the natural choice for me and have owned to date a few budget to mid-price models (D50, D300, D5000). only upgrading when a new feature that appealed to me was offered i.e. Live View and articulated LCD screen; until recently the Nikon D5100 was my sole digital SLR. For many years, like others, for photomicrography I worked around the lack of metering on the budget Nikons, as in traditional photo work, after a while a microscope user can judge the correct exposure quite closely and could rapidly obtain the right exposure after one or two trials. But the EFCS remained a feature lacking which was very appealing. At present after careful tests, I knew that for medium to high power objectives there was a range of camera shutter settings that had to avoid to guarantee no vibration with my Zeiss Photomicroscope III and stereos. I remained reluctant to move from a Nikon system as had a legacy of Nikkor AI lenses and assorted adaptors. But I recently noticed that for � or so a third party conversion adaptor with electronic contacts was available to allow Nikkor lenses to be used on the Canon EOS system while retaining infinity focus. This is possible because the lens flange to film / sensor distance on the Nikon F is 44 mm but 46.5 mm on the Canon EOS (source Wikipedia entry 'Lens Mount'), which is sufficient room for an adaptor. I offer some thoughts on the pros and cons of using these adaptors below. 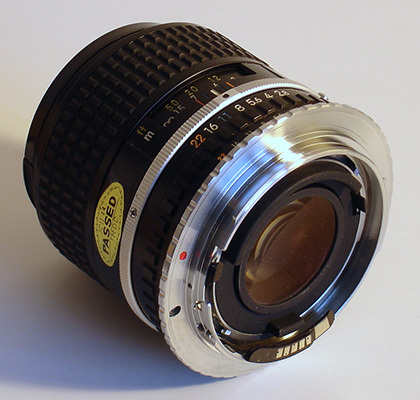 A typical Nikkor to Canon EOS adaptor, this one made by Pixco and widely available on eBay and elsewhere. A small electronics board with gold contacts makes the Nikkor lens compatible with the Canon EOS system. 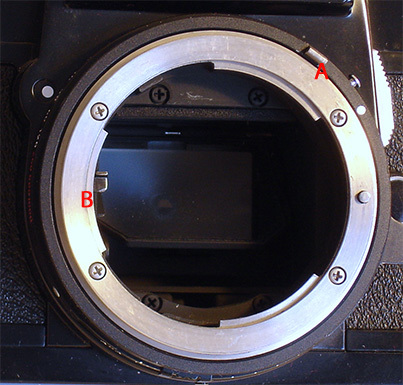 The black lever seen lifts the Nikkor lens locking pin when wish to remove the adaptor, but the adaptor remains firmly on lens if remove the Nikkor lens from the Canon body. Left: A Nikkor lens without adapter. 'A' is the AI (Automatic Indexing) ring which transfers the aperture setting to camera body. 'B' is the lever that only stops down the lens to the required f stop at moment of exposure. Right: Nikkormat FT3 film body. 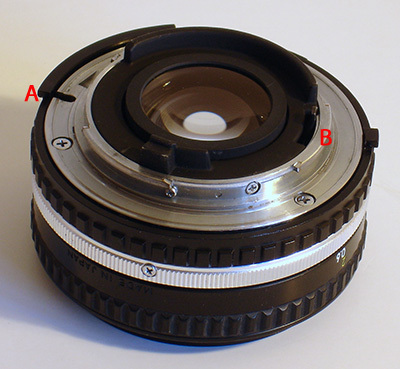 'A' is the rotating ring and peg that 'A' on lens acts on to transfer aperture information to the metering. 'B' is the lever that activates at point of shutter activation to stop down the lens via the lever 'B' on lens. Budget Nikon digital SLRs do not have the AI ring, so do not allow metering with the older AI lenses. 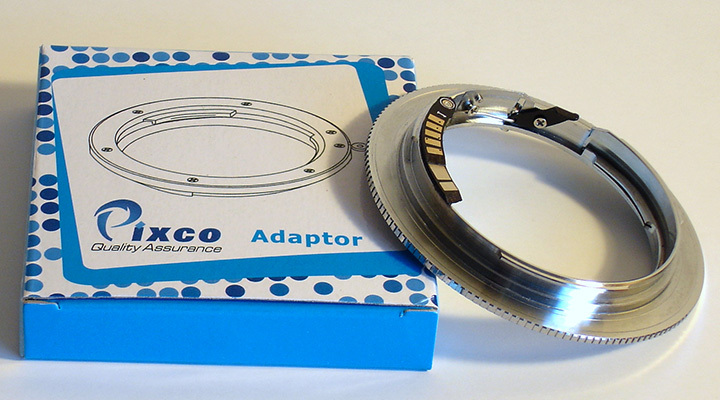 Left: The adaptor fitted to a Nikkor lens. Canon EOS does not use mechanics to transfer aperture indexing or set the lens f stop at exposure, but rather electrical contacts. The requisite electronics are part of the adaptor to allow a Canon body to meter in stop down mode. Right: A Nikkor lens on a Canon 600D body, my replacement DSLR body for the Nikon D5100. The slim adaptor is barely seen. - the adaptor is a very firm fit, with no slack, giving a robust camera body to lens coupling (but see Cons). - allows legacy Nikon lenses to be used on a Canon EOS DSLR. - metering in Av mode on a Canon body is retained with the Nikkor lenses (which it is not if Nikkor AI lenses are used on a budget Nikon DSLR body). - if the optical viewfinder is used and shutter half depressed, the focus confirm LED and beep is still active on the Canon and also displays which focus segments have been locked on (a feature not offered on budget Nikon DSLR bodies with Nikkor AI lenses). - expensive Nikon based adaptors such as extension tubes and tele-converters also remain viable on a Canon body as the adaptor is put on the final bayonet to body fitting. - the metering is in 'stop down mode', i.e. the iris is set to the exposure f-number before the exposure, thus reducing the brightness of the view in viewfinder or on Live View screen. - on this adaptor the electrical board is glued albeit firmly to a slim part of the mount. Time will tell how robust this is. Although I do very light photo work so hopefully won't be a problem. On the whole I am pleased with the move from Nikon to Canon for my type of photography. The metering and EFCS for vibration free photomicrography has widened the conditions I can carry out photography on my microscopes. An unexpected bonus and perhaps a rather ironic one, is that legacy Nikkor AI lenses are better supported on a budget Canon DSLR body than a budget Nikon, with both metering and focus confirm now offered. The stopped down metering may not suit some and of course there's no auto focus on old Nikkor AI lenses which may be important for those who do a lot of action photography (sport, children etc.). Although the skilled photographer managed for decades to effectively accomplish such 'action' work before the advent of autofocus. I primarily do stills photography (landscape, macro) so quite enjoy going back to the basics. I particularly enjoy using the silky feel of traditional metal mounted lenses and their focus / stop rings. I dislike the typical plasticky lenses offered nowadays by many of the manufacturers, with plastic on plastic focus / zoom often giving a very lumpy feel. As my brother Ian illustrated in a recent article, legacy SLR lenses can also work well on the new breed of mirrorless camera bodies like the Sony NEX range as adaptors are widely available. Some Nikkor lenses are delightfully well balanced on the NEX body. 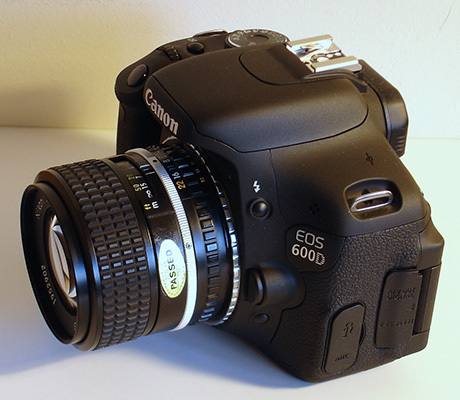 Footnote: The effectiveness of the Canon EFCS feature to essentially remove all shutter or mirror vibration in Live View mode has been clearly demonstrated by Charles Krebs in an article on his website. Since buying a Canon body I have also confirmed its effectiveness at optical magnifications and shutter times when camera hard coupled to my Zeiss Photomicroscope III; camera and microscope settings that would have been unusable with a budget Nikon body. In my article last month I illustrated that EFCS can be an invaluable feature on some mirrorless cameras (e.g. as offered on the Sony NEX 5N and 7) if hard couple camera to a microscope, because the double action of the shutter at exposure start can give potentially serious vibration problems. Published in the January 2013 edition of Micscape. � Onview.net Ltd, Microscopy-UK, and all contributors 1995 onwards. All rights reserved.